Strong physician and patient relationships are built on trust. Since being established as an independent nonprofit in 1936, the American Board of Internal Medicine (ABIM) continues to be dedicated to achieving high standards on which physicians, their peers and the public can rely. Core to ABIM’s mission is a commitment to transparency in how we carry out our work. In a recent JAMA article, “Fees for Certification and Finances of Medical Specialty Boards,” authors Drs. Drolet and Tandon examined the fee structure for initial certification and Maintenance of Certification (MOC) across the 24 member boards of the American Board of Medical Specialties, including ABIM. We welcome and appreciate the work of the authors, and agree with their assertion that medical organizations, including certifying boards, need to be accountable for how they use resources. The authors convey important information with this research, but one point – that examination fees accounted for 87.7% of revenue and 21.3% of expenditures while officer and employee compensation and benefits accounted for 42.2% of expenses – needs to be further clarified. We should not miss the point that staff compensation and the cost of certification are inextricably tied to one another. For example, ABIM staff time is devoted to producing, delivering and scoring exams. 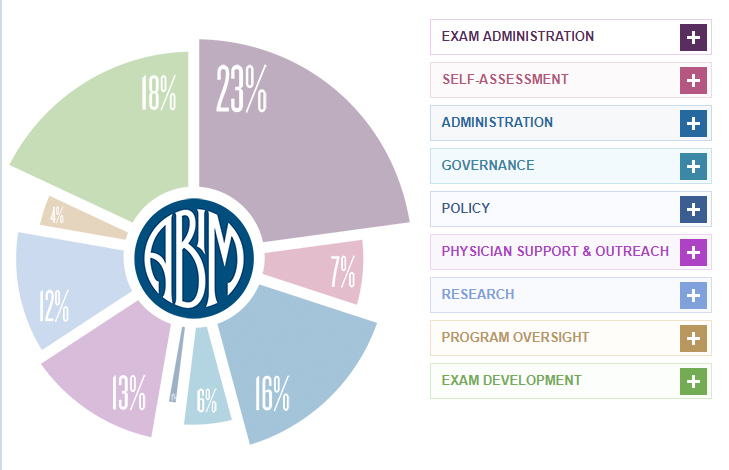 At ABIM, this multifaceted process supports more than 200,000 doctors practicing internal medicine in 20 different subspecialties. ABIM staff has also engaged thousands of physicians across the country about what they value and is using this input to update its MOC program, which provides doctors with a pathway to know that they are staying current in the medical knowledge they use to treat patients and make important care decisions daily. Recently announced MOC updates include introducing a new assessment option and recognizing more work doctors do every day with MOC points. ABIM has also been collaborating with doctors to increase the relevance of exams. We agree with the authors that more research is needed to assess the cost-benefit balance in order to demonstrate the value in board certification. While this work will certainly continue, there is already compelling evidence showing that MOC improves value of care without sacrificing quality and that board certified physicians command higher salaries. Additional articles related to certification and physician assessment are available on the research section of ABIM.org. ABIM looks forward to continuing our work with physicians to build more choice, relevance and convenience into MOC while maintaining high medical standards that we can all trust.